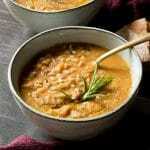 A simple farro soup made with borlotti beans, carrot, onion, pancetta and garlic. It's packed full of flavour and makes for a filling, warming and absolutely delicious dinner or lunch during the colder months. First finely chop the carrot, celery and onion. Add the olive oil and chopped veg to large pot and saute gently on a medium/low heat until soft. Add the pancetta and garlic and cook for a further 3 minutes, stirring occasionally. Rinse the canned borlotti beans and add them to the veg and pancetta with 2 cups/500ml of vegetable stock. Rinse the farro/spelt thoroughly under running cold water. Place the liquid puree back over a medium heat and add the farro or spelt. Add the passata, 3 more cups of vegetable stock (750ml), a pinch of salt and pepper and rosemary sprigs, stir the soup and cook covered for 30-40 minutes until the farro is cooked through. Serve in large bowls with a drizzle of olive oil, a sprinkling of pepper and some crusty bread.